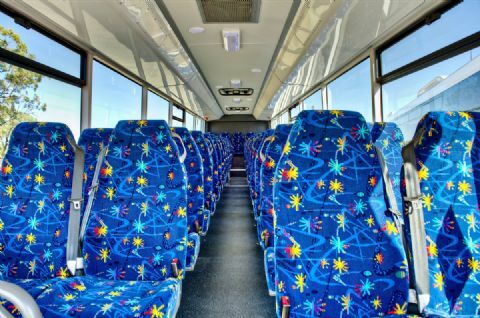 Department of Transport & Main Roads have in place a Code of Conduct for school students travelling on buses. The privilege of having school transport places a responsibility on every student to behave in a manner that ensures the safety and comfort of other students, other passengers and bus drivers. Young’s Bus Service supports this Code of Conduct and enforces its standards of behaviour. The Code of Conduct sets out 4 Categories of behaviour. For detailed information on the student Code of Conduct visit Translink then select travel and transport for school transport section. If students do misbehave consequences can range from warning letter to parent to short term cancellation of student’s travel entitlements, to permanent exclusion from the bus service. Students to stand a reasonable distance from the road. Be respectful of other people’s property. Scan your SIT card / Fare Card / or purchase cash ticket and take your seat immediately. Use of offensive or racist language, shouting, harassing & bullying, fighting, smoking or spitting will not be tolerated. Refrain from moving about inside the bus or swinging off handrails. Students must not put their feet on the seats. Students must not throw objects in or from the bus. Students must give up their seats to all adults and disabled passengers. Students must obey reasonable directions from the bus driver and not distract the bus driver, except in an emergency. Students must not vandalise or damage the bus in any way. Any vandalism should be reported to the bus driver. Follow directions given by the bus driver and show your appreciation by greeting him / her when you board and thank them when you get off.